The highly obvious, probable threats that nobody should say they never saw coming –yet are not always getting the attention that will resolve them. When our suspicions about the current global expansion arose in late 2016, at first we did not know what to look for. We had already warned about the risks posed by the unorthodox programs of global central banks several times (see, e.g., this, this and this), but that did not seem to be the only possible cause. The world economy had stumbled in 2015/2016 and yet recovered at a breakneck speed. What was going on? In early January 2017, we decided to make a broad survey of the global economy to find some answers. The first odd thing we noticed was the rapid decline in cross-border loans and stagnation (but growing share) of international debt securities since 2007. It gave a hint that 1) the global economy had not really recovered, and 2) the global banking sector was still in recession. This led us to issue our first-ever warning of approaching global crash. We kept digging, and in the summer of 2017 had an epiphany. We realized the global economy had been driven almost solely by China since 2009 (see Figure 2) accomplished with massive debt stimulus (see Q-review 3/2017 for more details). We did not know the term Gray Rhino back then, but it turned out the Gray Rhino of China was charging straight at the global economy. When the financial crash of 2008 morphed into a global recession, Chinese leaders reacted quickly. They started massive infrastructure programs that carried the economy to a renewed upward trajectory. These programs were financed by credit issued by state-controlled banks. But, once the stimulus was started, they could not turn it off. The former engines of the global economy, the US and Europe, remained weak. Without continuous, massive stimulus, the Chinese economy would fall into a recession. This was not an option for Chinese leaders as their mandate from the people relies heavily on increasing living standards and full employment (see, e.g., the book by Dinny McMahon). So, the credit machine was kept running full-blast. In 2015, Chinese leaders tried to stabilize the economy by tightening credit especially to the manufacturing sector. This led to a slump in the Chinese housing market, which had already weakened in 2014. Because real estate had been the backbone of Chinese economy for the past two decades, the overall economy soured quickly. The Chinese stock market started to fall, and the global economy hiccupped. Another round of massive debt-driven stimulus, this time transmitted through the ‘shadow banking’ sector, was enacted. 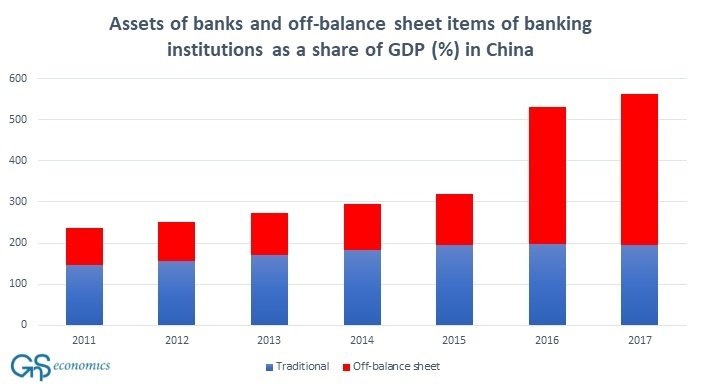 During 2016 and 2017, China unleashed a never-before seen credit bonanza during which the size of the “shadow banking sector” tripled (see Figure 2). Combining the credit banks extended to the non-financial sector and the off-balance sheet items of banking institutions, by the end of 2017 the total assets of the banking sector stood at a horrific and thoroughly astonishing 563% of GDP. 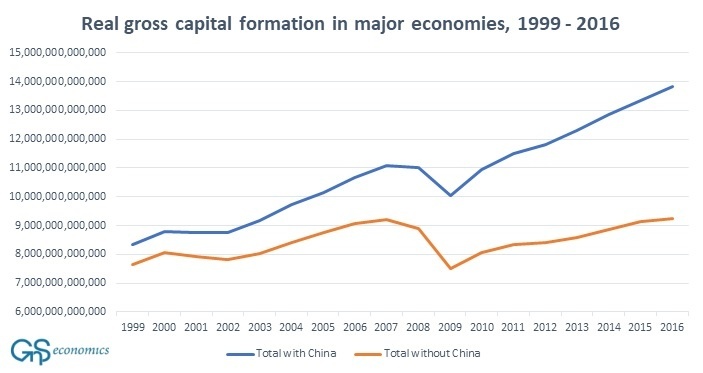 Even disregarding the off-balance sheet items, China completely surpasses all historical thresholds preceding financial crises compared to the level of economic development (see Figure 3). Between the first quarter of 2009 and the second quarter of 2018, an incredible 56% of all credit issued to non-financial private sector globally has come from China. China has been able to accumulate such astronomical levels of debt because it had something similar to a command-and-control grip on the banking sector. It can order banks to lend. However, this has an obvious drawback. A growing share of such loans will go to non-productive investments each year. This is likely to be the biggest reason why the total factor productivity of China has fallen since 2012. It grew like clockwork throughout the first eight years of the new millennium and again in 2010 and 2011, but then a massive shift occurred. This has been visible also at the global level. Eventually, any extended lending spree will lead to an impasse where households and companies will not—or cannot— absorb any more credit. Their need to meet their obligations forces them to start paying back debt. In a highly-levered economy, this means that the relentless rise in asset prices eventually halts, and then starts to decline—sometimes precipitously. The economic actors default or declare bankruptcy, and suddenly the whole asset universe starts to lose value. This the ‘Minsky Moment’. China has been fighting against this since 2016 with draconian capital controls, increasing restrictions on the financial media and by implementing large-scale liquidity operations whenever needed. It has been able to slow down the extension of credit, but even so, it still grows faster than GDP. Notably, the first two quarters of 2018 saw the biggest increase in credit to the non-financial sector since 2009 (see Figure 3). However, this credit binge has resulted in relatively little GDP growth (which begs the question: how low would it be without it?) and several indicators suggest deepening weakness ahead. Even if China would be able to keep its economy growing in normal times, it is becoming increasingly ill-equipped to withstand a recession in Europe and in the US. Because of the ever-ballooning balance sheets of banks and debt, China simply will not be able to debt-stimulate its, or global, economy out of a recession similarly as it did after 2008. That is why the day of reckoning is approaching. In the 2017 Economic Forum of Davos, President Xi Jinping noted that China has been responsible for 30% of global growth since 2008. This seems accurate, and deeply troubling. China has eclipsed all historical examples of financial manias. Chinese leaders, with the help of global central bankers, have created a fragile economy both domestically and globally. We can assume that they have done all this with the best of intentions, but that does not change the inevitable, and potentially dramatic end-results. Presently, the world economy simply cannot cope without a continuous stream of economic stimulus: debt creation, most notably from China. And economic history clearly and consistently illustrates how credit bonanzas, like the one ongoing in China, end (badly). 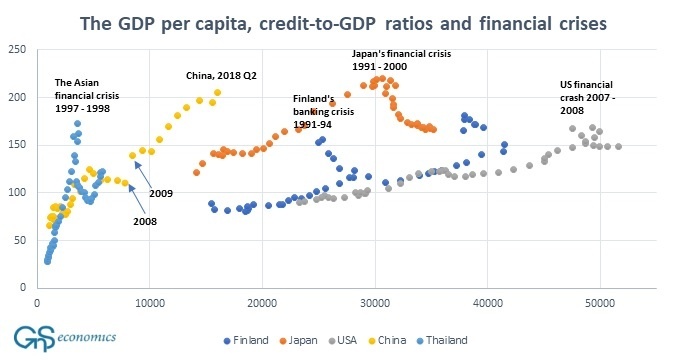 But, the credit bubble of China is just an end-point of a long line of consecutive credit bubbles, which started in the 1970’s, or even earlier. Central banks, with the exception of the Fed in early 1980’s, have kept the global credit machine humming by intervening every time a serious contraction started to emerge. This has led to the massive accumulation of global debt over the years, which has reached an epochal, and practically-incomprehensible $244 trillion, the equivalent of more than three times global GDP. China has been in the forefront since 2009, dragging the global economy along by astronomical debt stimulus. This is obviously unsustainable, by any rational interpretation. We’re truly approaching uncharted waters. In the December issue of our Q-review, we mapped out the scenarios of how this all is likely to play out and on what timeline. There are only perilous roads ahead, with unsettling outcomes ranging from full-blown global debt monetization by the central banks to a complete crash of the global financial order. China bailed out the global economy in 2009 to everyone’s relief, but now, the consequences of those policies threaten to bring everything down. The Gray Rhino is almost here.